View this sample resume for a massage therapist, or download the massage therapist resume template in Word. If writing your resume is a pain in the neck, relief is in store. To be considered for top massage therapist jobs, resume expert Kim Isaacs says it helps to have a comprehensive resume. 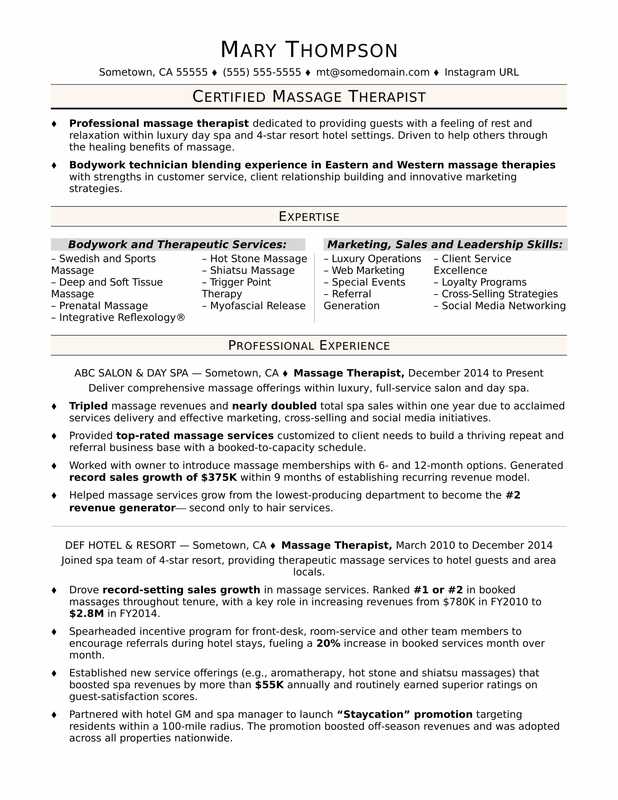 For resume writing tips, view this sample resume for a massage therapist that Isaacs created below, or download the massage therapist resume template in Word. And if you need more help, get a free resume evaluation today from the experts at Monster's Resume Writing Service. Jobs for massage therapists are projected to grow by 26% (or 42,100 jobs) from 2016 through 2026, which is much faster than average, according to the Bureau of Labor Statistics (BLS). You'll find the highest level of employment for this job in the following states: California, Texas, Florida, Colorado, and Washington; and in the following metropolitan areas: Los Angeles, Denver, New York City, Anaheim, and Chicago. As a massage therapist, you can expect to earn a median wage of $39,990 per year, or $19.23 per hour, according to the BLS. Additionally, you can learn about personal service careers and search for massage therapist jobs on Monster. Professional massage therapist dedicated to providing guests with a feeling of rest and relaxation within luxury day spa and 4-star resort hotel settings. Driven to help others through the healing benefits of massage. Bodywork technician blending experience in Eastern and Western massage therapies with strengths in customer service, client relationship building and innovative marketing strategies. Deliver comprehensive massage offerings within luxury, full-service salon and day spa. Tripled massage revenues and nearly doubled total spa sales within one year due to acclaimed services delivery and effective marketing, cross-selling and social media initiatives. Provided top-rated massage services customized to client needs to build a thriving repeat and referral business base with a booked-to-capacity schedule. Worked with owner to introduce massage memberships with 6- and 12-month options. Generated record sales growth of $375K within 9 months of establishing recurring revenue model. Helped massage services grow from the lowest-producing department to become the #2 revenue generator¾ second only to hair services. Joined spa team of 4-star resort, providing therapeutic massage services to hotel guests and area locals. Drove record-setting sales growth in massage services. Ranked #1 or #2 in booked massages throughout tenure, with a key role in increasing revenues from $780K in FY2010 to $2.8M in FY2014. Spearheaded incentive program for front-desk, room-service and other team members to encourage referrals during hotel stays, fueling a 20% increase in booked services month over month. Established new service offerings (e.g., aromatherapy, hot stone and shiatsu massages) that boosted spa revenues by more than $55K annually and routinely earned superior ratings on guest-satisfaction scores. Partnered with hotel GM and spa manager to launch “Staycation” promotion targeting residents within a 100-mile radius. The promotion boosted off-season revenues and was adopted across all properties nationwide.